... lets visit. One building at a time. I'm confident I'm not alone (in fact I know this to be true based on acquaintances) when I say that I am obsessed with Bedford Falls. 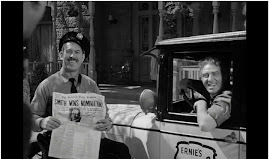 Now read that again ... Bedford Falls, not the movie It's a Wonderful Life with Jimmy Stewart. Bedford Falls is where my obsession begins and ends. Now before fans fume and begin to fill my inbox with furious hate mail let me explain. Do I love Jimmy Stewart? Of course! He along with Gary Cooper transcend the mere word star and rise even above the titans of their era to make the "stars" of today seem like cheap glitter on poster board in comparison. Do I love the movie ... or as I like to call it ... the experience? More than any other! It's my favorite thing ever put on film ... period. Back up 14 words and read (did you count?) that key description again ... experience. That's the label I put on this films ability to implant emotion. Definitions of the word state it as "the knowledge or practical wisdom from observing , encountering, or undergoing of things" & "the totality of the cognitions given by perception; all that is perceived, understood, and remembered". The experience of watching It's a Wonderful Life has a way about it, which no other film ever has been about to project again. Maybe it's a combination of 1940's film, Capra's skill, and the abrasive effects of modern society on this American's psyche but the intangible effects of that combination can been seen as my obsession with Bedford Falls because that combines all elements of the film into a place, an environment, a micro world that I can't but wish reality existed. You have several things fused together to make one amazing mixture of 1940's society, small town charm, wonderful God fearing characters, great directing, perfect casting, a CHRISTmas plot, and Donna Reed and Jimmy Stewart! 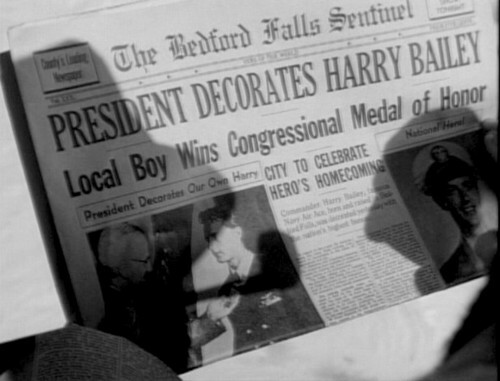 Bedford Falls is a fictional town from a movie, but it's also an imaginary representation of an entire era for me. It captures on film, what today's society and culture have lost, broken, forgotten, thrown away, or worse simply don't want to see. Where does that leave us? Well ... besides with watching the movie thousands of times we have at least one other outlet. And that's building and collecting the actual mini version of the town itself. There have been many versions of the village and I may at some point go into the history and pieces from all the various collections. But for now, I want to spend some time visiting my collection aka my own Bedford Falls village. I have the Enesco version, which was released from 2002 - 2007 in series'. This tour will visit each building of the series and wrap comments and clips from the movies around various pictures of the village pieces. I love this series, and I have always been frustrated that I couldn't find a good site that spent a lot of time with many pictures of each building ... so decided to indulge myself if nothing or no one else and do it here. One feeling the movie always brings is a sense of nostalgia ... for a time and place I was never at. This village brings a lot of that same sentiment and many of those same feelings from the movie are expanded and strengthened when you and your family take time to collect and set up these villages. These posts will hopefully culminate with one detailing the entire village setup and some video of my Bedford Falls. I just can't thank you enough for all the time and effort that went into this blog. I just stumbled across it today and it's EXACTLY what've I've been looking for, as I've spent the past few months "converting" my village to match up with my ideal. 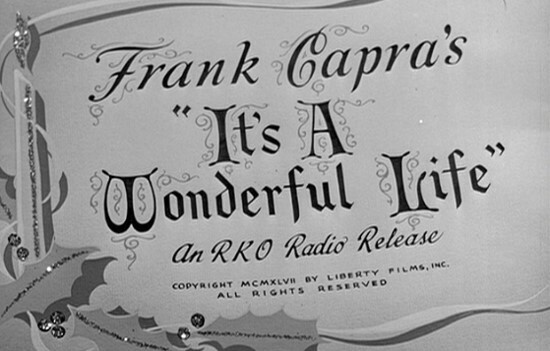 It's a Wonderful Life represents my "ideal". Your very first post here resonates with me...I may as well have written it myself, as it says everything I feel about the movie and Bedford Falls in general. I'm so looking forward to reading each post and adding more detail to my blossoming village. At a glance, I never saw the post showing your entire village assembled together...I hope it's here!